Warning: The following has nothing to do with sports, unless driving by Disney’s Wide World of Sports four times in a week counts. 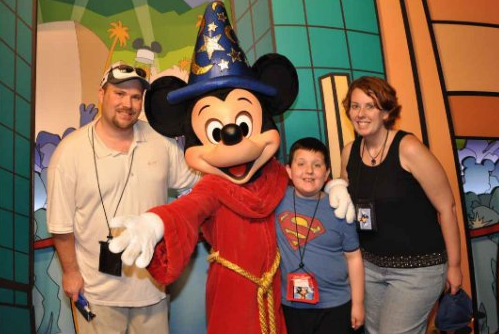 So, as you can see from the picture, the family (extended by my wife’s parents) spent a week in Orlando at Disney and Universal. 1. Autism can rear its head at a moment’s notice. We knew that we were taking a risk exposing the boy to the unpredictable elements of theme parks, crowds, air travel and a week in a strange house. And, for the most part, it went really well. But there were still times when you could see the internal battle written all over his face and hear his voice drop to a whisper in an effort to deal with the assault on his senses. I’m proud of the boy for the way he handled a crazy, crazy week. I think he may have even had a good time. The folks at Universal were wonderful with Ethan’s accommodations. They were patient, and they helped us avoid what would have been an hour wait on anything in the park at both Islands of Adventure and the main park. The Disney folks were also helpful, but seemed overwhelmed a bit by the sheer number of folks on some days. Without their help, the trip wouldn’t have been possible. 2. Visiting central Florida in mid April should be avoided at all costs. OK, I’m exaggerating a bit. But it was somewhere between 85 and 92 every day, with a sun weighing heavier than the labor crisis over the NFL. It was Ethan’s spring break, which meant that he had the week off of school. It was very busy. How busy, you ask? THEY. STOPPED. LETTING. PEOPLE. IN. On Monday, at Magic Kingdom, the park reached its close-the-parking capacity of 75,000. I believe it. It was insane. If you were making a list of stuff I can live without, being hot and crowded would be near the very top. Magic Kingdom was packed, and though the crowds thinned a bit as the week rolled on, it was still more folks than I like to be around. 3. If you’re shopping, make sure it fits in a bag. Otherwise, you’ll wind up in the UPS store on the Friday morning before you fly back mailing a Harry Potter broomstick to yourself. You would think you could put a Nimbus 2000 on autopilot, but it seems that’s a no-go. 4. Anything that can go wrong, usually will. If Ethan wasn’t having enough issues dealing with the trip, he can down with an ear infection that forced us to visit a minute clinic for some prescription ear drops. I guess his pool acrobatics, including an assortment of front and back flips, finally caught up with him. 5. If you’re going somewhere, let my wife plan it. The house we stayed in was sweet! Four beds, three baths and a screened-in, in-ground pool. All for cheaper than we paid for park admission. A. Universal Islands of Adventure: Fun. Lots of fun. Ethan loved meeting the superheroes and riding the rides. It wasn’t too crowded, except for the Harry Potter part, and it was just an all-around good experience. B. Magic Kingdom: You need to see the castle and late-night fireworks, just to say you did. You need to ride Space Mountain, because Ric Flair said so. The Pirates of the Caribbean ride was cool, too. C. Disney Hollywood Studios: Way too much pavement for a 90-plus degree day, but I thought it looked cool. Tuesday was probably Ethan’s most challenging day, so perhaps it skews my opinion a little, but I wasn’t blown away. D. Universal: A good park, but it was very, very busy. The ride lines, even with our assistance pass, were a test of patience and understanding. And no, I didn’t pass. E. Epcot: Far and away, my favorite park. Plenty of kid stuff, with some adult fun added in. Easily could have went twice, even though the boy provided a numbered list as to why he didn’t want to ride the boat across the lagoon. 8. There are some things worth knowing about Florida. First of all, even at 5 a.m., there’s always traffic on I-4 in Orlando. Next, get ready to wait in line. At parks, on the highway, on off-ramps, at the Western Union in Publix and in any restaurant just know that there are at least five people from Florida already waiting there. All kidding aside, no one that went on this trip had ever been to Disney. My family couldn’t afford it when I was young, and neither could my wife’s. My son will be able to say that’s he’s been. He took his autograph book and picture with Spiderman – his new most-prized possession – to school for another Ethan-inspired show and tell. He beams with happiness when telling people how Lisa (from the Simpsons) played with his hair and how Minnie Mouse gave him a kiss. There are more than 180 pictures of the trip in my wife’s Facebook folder, and I bet 170 have Ethan in there somewhere. He’s smiling in every one of them. This entry was posted on April 26, 2011 at 1:50 pm and is filed under Family. You can follow any responses to this entry through the RSS 2.0 feed. You can leave a response, or trackback from your own site.